After the end of the War in 1814 Napoleon was imprisoned on the island of Elba and the Congress of Vienna started its work to bring about a permanent peace. However, everything was thrown into turmoil with Napoleon’s escape to France a year later. This caused an urgent recall of the 28th (North Gloucestershire) Regiment to join Wellington’s army in Belgium. They were formed up in Sir James Kempt’s Brigade of Sir Thomas Picton’s 5th Division. On 16th June 1815 at Quatre Bras the 28th in company with the 1st Royal Scots marched to the support of the hard-pressed 42nd and 44th, forming square and standing firm in a tall field of rye while subject to continuous attacks from French cavalry. “The rye in the field was so high, that to see anything beyond our own ranks was almost impossible. The Enemy, even, in attacking our Squares, were obliged to make a daring person desperately ride forwards and plant a flag, as a mark, at the very point of our bayonets. On this they charged, but were invariably repulsed. “It fell to the lot of the 28th to bear a leading share in this Action, and I may say they lost none of their former reputation. “They were frequently hardly pressed, but never lost their discipline and their self-possession. “Once, when threatened on two flanks by what Sir Thomas Picton imagined an overwhelming force, he exclaimed, “28th, remember Egypt.” They cheered and gallantly beat back their assailants, and eventually stood their position. Two days later at the Battle of Waterloo the 28th repeatedly displayed both its renowned dash and steadiness when it played a critical part in defeating the first attack of D’Erlon’s French 1st Corps. “My Brigade consisted of the 28th, 32nd, 79th, and 1st Battalion 95th Regiments, and on poor Picton’s fall (in the first attack that the enemy made) the command of the 5th Division, with the 6th that had just come up to our support, and all the troops, in short, on the left of the Great Brussels road, devolved upon me throughout the day. Attacks continued throughout the afternoon aimed at piercing Wellington’s centre, and the farmhouse of La Haye Sainte finally fell to the French in the early evening. From there, Kempt’s Brigade was subject to withering fire, and the 95th were forced to abandon their forward position. Following the defeat of the last French attack made on Wellington’s position by the infantry of the Imperial Guard, the 28th took part in the general advance. “At this moment I saw the Duke, with only one Staff officer remaining, galloping furiously to the left. I rode on to meet him. “Who commands here?” “Generals Kempt and Lambert, my lord.” “Desire them to get into a column of companies of Battalions, and move on immediately.” I said, “In which direction, my lord?” “Right ahead, to be sure.” I never saw his Grace so animated. The Crisis was general, from one end of the line to the other. All that remained was to pursue Napoleon to Paris, and the war was ended. 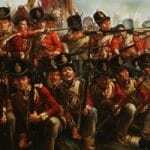 Picture: The 28th Foot at Quatre Bras, detail from the painting by Lady Butler.